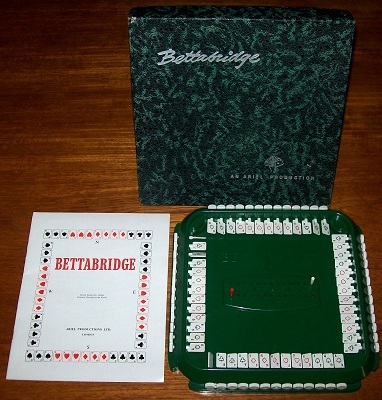 'BETTABRIDGE' GAME: Bettabridge is a revolutionary invention devised and designed by a Contract Bridge player and teacher of wide experience as an aid for the beginning, a boon to the teacher and an indispensable labour-saver to the keen Bridge player of "problem" standard. The game is in complete and excellent condition. The system is in full working order and the substantial instruction booklet is in very fine condition.